Click Here To See Amazing Spider-Man #57 Comic Book! 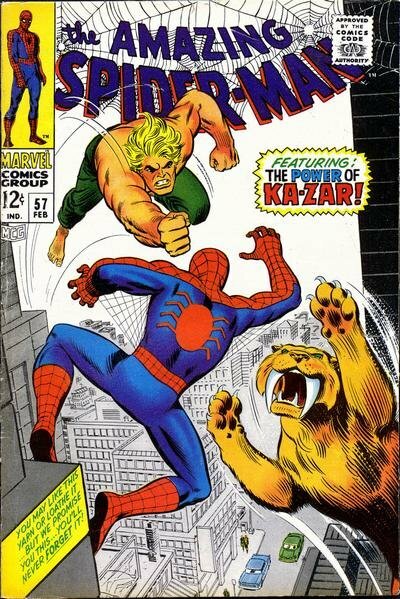 Check out this very nice 1967v SILVER AGE AMAZING SPIDER-MAN page, which was penciled by the great John Romita and Don Heck, and inks by Mike Esposito, from the EVER CLASSIC story titled: "The Coming of Ka-Zar!" This nice page features J Jonah Jameson and KA-ZAR in all 3 larger panels at top as JJJ tries to convince Ka-Zar to capture Spider-Man, and at the bottom we get 3 nice panels of Harry Osborn finding Spider-Man's SPIDER-SIGNAL in Peter Parker's closet as for the VERY FIRST TIME Harry wonders how Spider-Man and Peter Parker are connected to one another! There is a small corner missing from lower right corner but it doesn't reach into any drawn artwork thankfully. SILVER AGE 1960's "AMAZING SPIDER-MAN" pages are VERY hard to find in the hobby these days, so don't miss out on a great opportunity here to own a nice SILVER Age 1967 AMAZING Spider-Man page! ALL art on our website (including this one) are able to be purchased with VERY fair time payments, and trades are always considered towards "ANY" art on our website! Just send us an email to mikeburkey@aol.com and we can try to work something out.